This beautiful natural wood-look rectangular accent table is a great addition to any living room, family room, or home office. With sufficient surface space for snacks, drinks, or tablet as well as a convenient storage drawer that slides out on either side for remotes, coasters and other accessories, this table is perfect for movie night, snacking in front of the tv or entertaining guests during the big game. The chromed metal base provides sturdy support along with a fashionable touch that will suit any decor. Bring the magnificence of the natural world indoors with this accent table that showcases all of the prolific wonders the outdoors has to offer. Multi-faceted in nature, this piece can be used as a stool, table, or ottoman should the occasion arise. Crafted out of a rich mango wood that has a natural discolouration, this tabletop has an added layer of depth and beauty that doesn't compromise its structural integrity. Further enhancing its organic roots, all of the materials used are eco-friendly and sourced from sustainable plantations. With a fine grain detail illuminated by its natural distressed finishing, each and every table has a unique look that is only further enhanced by its natural components. Bring a taste of the exotic to your dicor with this gorgeous table. The Moroccan pattern cut-out provides visual interest while the silver leaf finish adds depth and character to each individual piece. Finished on all four sides, this piece can be used for a multitude of purposes. Great as a side table in the living room, and accent table in a hallway or a night table in the bedroom. Place multiple pieces together in front of a sofa for a unique, mobile coffee table. Accent Table - Natural With Chrome Metal This beautiful natural wood-look rectangular accent table is a great addition to any living room, family room, or home office. With sufficient surface space for snacks, drinks, or tablet as well as a convenient storage drawer that slides out on either side for remotes, coasters and other accessories, this table is perfect for movie night, snacking in front of the tv or entertaining guests during the big game. The chromed metal base provides sturdy support along with a fashionable touch that will suit any decor. 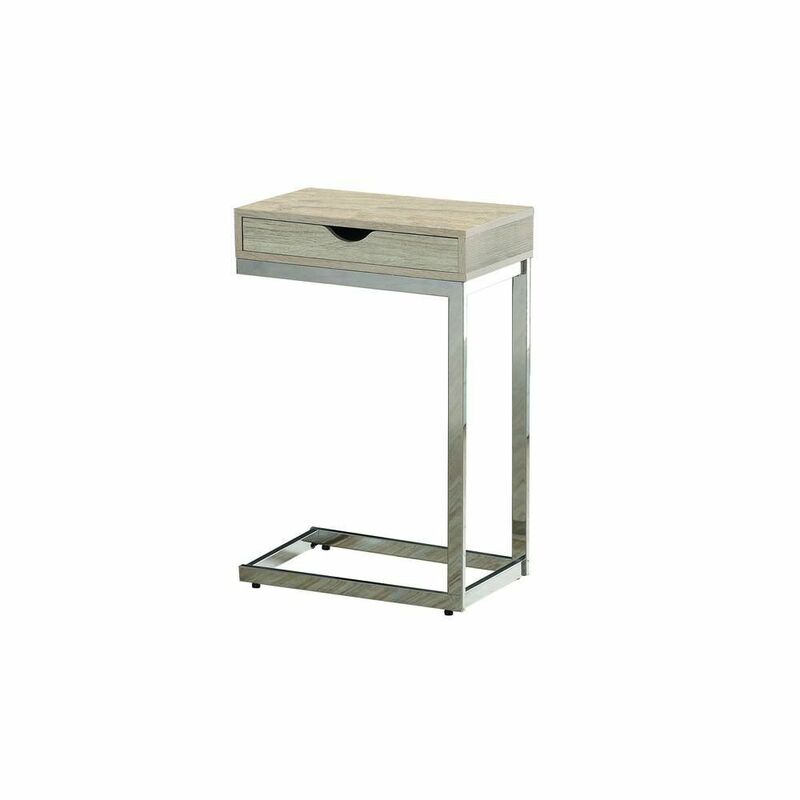 Accent Table - Natural With Chrome Metal is rated 4.0 out of 5 by 2. Rated 4 out of 5 by Jude from Really nice looking. I see other reviews mention it's easy... Really nice looking. I see other reviews mention it's easy to assemble - but I didn't find it as obvious since the instructions weren't very detailed. Once I figured it out, it was pretty quick. Overall I love the look, my only issue with it is that for me the drawer doesn't slide out super easy. Rated 4 out of 5 by HomeDepotCustomer from Very easy to assemble. A little smaller (lengthwise) than I... Very easy to assemble. A little smaller (lengthwise) than I realized by looking at measurements. Love the faux wood finish—great color between natural and driftwood. Can you install the drawer to face either way? Hello, the assembly of the drawer is not interchangeable. It must be assembled at one end. For your info, the drawer slides out completely on either side. We hope that clarifies. Thank you.